These sounded interesting, as I had some fresh raspberries and wanted to try a new scone recipe. I wasn’t sure about the combination of oats, raspberries and ginger, but they were really quite good. Not too sweet, nice crisp edges, and excellent texture. I liked the author’s suggested technique of shredding the cold butter, as it did seem to aid the blending process nicely. I sprinkled some turbinado sugar on top just before baking. We’ll definitely make these again. Best pancake I've ever made! Now THIS is coffee cake!! This cake is enormous - truly fit for a crowd. It's baked in a 9x13 pan and rises all the way to the top. Coffee cake for a crowd. The cake has three parts - the cake batter, a cocoa filling, and a topping. The cake is made by first putting down half the batter. Then the filling is sprinkled on top of that. The second half of the batter is then added (I always find it tricky trying to spread batter over a topping but I managed). Finally, a crumb topping is spread over the very top. In my oven, this took about 55 minutes to bake. I left it for 20 minutes to cool before trying a piece and was able to remove a piece with no problems. Oh my! Moist but light cake with a delicious center and lots and lots of crumb topping. Perfect for serving with coffee or tea. Simply wonderful. Turned out delicious, received rave reviews. This was really good! I didn't have any sour cream, so I substituted buttermilk for the whole milk and sour cream, and it turned out great. I also scaled back the cinnamon (a little more than half of what was called for), as the recipe called for a lot, and I've had previous recipes where the cinnamon was just overpowering. The crumb topping seems like a huge amount - but the results were excellent. We'll make this again without a doubt. I hoped this would be a good way to use up stale challah and brioche rolls leftover from Christmas. The flavour was very nice and I still like the idea of the recipe but the portion of bread that was submerged in the custard was just too soggy. I used a 9" pie plate since I didn't have an 8" cast iron skillet and forgot to grease it; the french toast didn't stick so the first step of melting butter etc and the use of a skillet are unnecessary. Light, fluffy pancakes with great carrot cake flavour. I skipped the cream cheese spread as they were quite tasty on their own but family enjoyed them with a drizzle of maple syrup. They browned too quickly on a medium heat setting, leaving the interior uncooked; a slightly lower heat setting worked well. We really loved these. The cream cheese spread really made them. Fantastic! Loved the addition of black pepper. Did not care for this at all. It didn't behave as a Dutch baby should, it was really, really flat and not pillowy at all. The flavor just wasn't there either. These are really, really good. She's not lying one bit, they are giant! But the recipe works as instructed and the result is quite delicious. This is a good recipe, I think, though I have to say that my bacon didn't crisp as much as I usually prefer. I like super crispy bacon. But, flavors are good! And it was fun to make, slathering that coffee smear all over bacon slices. These may be some of my favorite pancakes ever! Tastes exactly as advertised! Didn't like these at all. The picture is beautiful, shows these plump, chewy-looking cookies, but the cookies I got were flat and crispy to the point of dry and crumbly. They went into the trash. These are terrific cookies. When I first made them I thought they were just good but when I found myself back at the cookie jar...well, just good didn't cut it. Bet us can't eat just one. These are amazing cookies! I took them to friends who'd just had a second baby and their 4 yo devoured them! Incredible cookies. These are a household favourite. It's appropriate that this recipe is in the "I need a hug or brownie" chapter. Super comfort, straight out of the oven therapeutic cookies that can help you get through the most stressful moments in your life. Another +1 for amazing cookie. It is my favorite chocolate chip cookie recipe and that's saying a lot. Love these, can't wait to take them to the cookie swap. Really great. Nice moist cookies. The cinnamon, pumpkin and chocolate a great combo. I wasn't a huge fan of these - agree that the brownies were too cakey... I don't think I was a huge fan of the graham crackers and marshmallows sprinkled over the top either. I think the marshmallows could have been better attacked under the grill to get a better texture. If I make these again, I will use my usual brownie recipe and add in the marshmallows and graham crackers. The brownies themselves were too cake-y for my taste. Why oh why did this have to be soooo delicious!? Could not stop eating it! It's kind of everything your inner child wants in pudding. A very respectable apple crisp! I loved the addition of hazelnuts, a nice twist from usual walnuts or pecans. it makes a ton, too. Make sure to add some salt! It helps. Cake really doesn't get much easier than this. As soon as the batter goes in the oven, the icing is started. Once the cake is pulled from the oven the hot icing is poured on top where it very quickly firms up. The frosting becomes melded with the cake and there's a nice mix of cake and frosting in every bite. It's moist and chocolatey with crunch provided by the walnuts. The batter came together easily with a whisk and a spoon and baked up beautifully into a very moist and well-spiced cake. I reduced the sugar by 1/2 cup and skipped the sugary glaze. It tasted great the first day but was even more delicious on the second. Even people who claim they do not like peanut butter like this cake. It has a nice depth and isn't too sweet. Works great as a sheet cake in a 13x9 pan. Brought this cake into work and it was a big hit. I loved how moist this cake was, helped along by the crushed pineapple. I mixed sultanas and walnuts through (optional ingredients) and topped with the cream cheese frosting and extra walnuts. Will make again! One of our absolute favorite skillet cakes! Works with pecans instead of walnuts if you prefer, though the walnuts are great too. In the last step of mixing the batter, she instructs to stop mixing and fold in the last bit by hand. Do it. Your cake is a tad too dry otherwise. This is a simple delicious cake, ready to eat in 40 minutes. I love it. Photo included. This got RAVE reviews. So good. I turned it into a sheet cake without changing the recipe at all, just baked it slightly longer. It worked wonderfully and saved a lot of time. Very good, basic vanilla cupcake. They baked up with a nicely domed top, fine, moist crumb and great vanilla flavour. I reduced the sugar to approx 3/4 cup (160g) and they were sweet enough. I also baked them on the middle rack in my oven. This really is the best chocolate frosting! I usually use hot chocolate mix and it works great. Made without any of the suggested variations as a topping for the kitchen sink carrot cake. Tasted great. Make sure everything is well softened and blended to avoid lumps! A solid, basic frosting recipe. Works just fine with vanilla extract if you'd rather not go to the trouble of scraping vanilla beans. But, if you double the vanilla beans she calls for, it's really pretty with all those brown flecks against the white frosting. I loved this on a deep chocolate cake. I couldn't taste the bourbon at all, but this was still moist, delicious banana bread. I doubled the chocolate chips and skipped the nuts because of an allergy where I was bringing this bread. In my oven, I needed to bake 85 minutes -- which is 25 longer than the higher amount listed in the recipe. If I baked it straight through without checking on it, 80 minutes would probably have been sufficient. With the long bake time, the outside got quite dark, though not burned. At 60 minutes, it was a lovely golden color, but the inside was still jiggly, so extra baking time was a necessity. My Pyrex loaf baking dish is on the smaller side at approx. 8.5 x 4.5 inches which also affects the baking time. You can eat this by the handful! I've been looking for a good chocolate granola for a while now. This may just be it. A nice mix of oats, almonds, coconut, and cocoa are bound with butter, sugar and honey. The resulting granola is light and crisp with no hint of greasiness. It's chocolatey and just a bit salty. I think it would be wonderful added to some Greek yogurt and if you used it as a cereal it would turn your milk all nice and chocolatey. Not too sweet with subtle chocolate flavour. Not what I would eat for breakfast but a nice alternative to a cookie if you're looking for a sweet snack. These were truly amazing. I can't wait to make them again. This is now one of my go-to chocolate cake recipes. The sour cream makes the cake super moist, and gives the glaze a nice bit of tang. Note the glaze doesn't end up looking like the frosting in the picture in the book...it's actually more glaze-like. This bundt cake comes together quickly with common pantry ingredients. The batter is quite loose and I had my worries about it coming out of the pan intact. My worries were unfounded, however, as it released nicely. The recipe had a baking time of 45-60 minutes. I checked after 45 minutes and my cake was done. In fact, it probably could have been taken out just a few minutes earlier. It is a bit crumbly and dry which I think could have been avoided with a shorter baking time. The glaze called for does not match the picture in the book which is clearly a frosting. I prefer glaze anyway. I melted the chocolate and butter in the microwave because that is so much easier than using a double boiler. Again, the glaze was very loose and it made me nervous. After a few minutes, however, it thickened up enough to pour over the cake. This is quite a good cake with nice chocolate flavor. This cake was delicious and moist. Made for a friend's birthday cake in my swirl bundt pan and decorated with icing and silver cachous. After some difficulties with getting the glaze / icing to work I did some internet research and found other versions of this recipe that use 3C icing sugar mixed into the glaze - this worked like a charm and gave an icing as it looks in the book. So good! Really tender crumb, and a great deep chocolate flavor (we used Valrhona cocoa). A new chocolate cake favorite for us - and we've baked a lot of chocolate cakes! This was really good and I love the idea! However, due to the similarity in color of the white chocolate and the whipped cream, it's very tough to know if you still have streaks or if you're fully incorporated. Addictively good. Especially around the holidays. They are cakey, but surprisingly they keep well sealed in a tupperware container. Easy log to slice and bake and therefore make ahead. Another Rice Krispie variation. This one uses browned butter and peanut butter. It calls for a bag of mini marshmallows but I used 7 oz. of marshmallow creme as it's what I had on hand. At first the butter, peanut butter and marshmallow didn't really want to come together smoothly and it looked curdled. After quite a bit of stirring, I was able to get it smooth. There was plenty of this mixture to add to the 6 cups of rice krispies which made them a bit more moist than the classic recipe. I sprinkled the top with a small amount of mini chocolate chips because everything peanut butter tastes better with some chocolate. Very tasty and popular version of the classic, and just as easy to put together. Very nice twist on the usual crispie treat! They went fast at a beach day gathering. These were so easy and so delicious. Totally moreish! Snickerdoodles are hard to mess with. Joy gives these a special touch with some added vanilla beans. These are not our favorite snickerdoodles. We prefer ours with a distinctive crunch. These are crunchy on the perimeter but the center remains soft and chewy. I'm not sure if this center would have hardened if they had been left in the oven longer and I also know that some prefer their snickerdoodles this way. The cookies are very good - they're just not our personal favorite. Not to be mistaken for a breakfast food because of the use of whole wheat flour, this butter-, egg- and sugar-rich cake is a dessert, and a very good one. Not too sweet, moist and surprisingly fluffy with a pleasant, slightly nutty flavour. Though the hand-cut fries aren’t glopped with saucy meat, they are still drowned in cheese, so while there are ample crisped edges, don’t be surprised if they’re not crisp through and through. They aren't over the top sweet, but they're plenty chocolaty. And they have just right amount of goat-y goodness both flavor-wise and in that great creamy-crumbly quality that we love in goat cheese. The avocado comes through in a mellow way, meshing with the pound cake in a way that's intriguing but not at all over the top. Studding dense, crumbly peanut butter cookies with little bits of bacon might seem like a bold move, but when you think about how tasty the Elvis is, it all starts to make whole lot more sense. 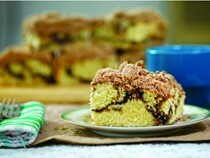 It's delicious in a way that coffee cake should be, uncomplicated and easy to love, kind of like the perfect mate. I should have known they’d be delightful, based on the source...This recipe is the kind that will go instantly into a regular weekend morning rotation. Moral of the story - these are chocolate pillows with a sweet/salty peanut butter fluff filling. (SO.GOOD.) Make them. Eat them. And don't be a serial killer. They are fudgy and chewy and all the best of the brownie and white chocolate mac nut (WCMN's to those of us cookie fanatics) universes, respectively, smashed together into one. 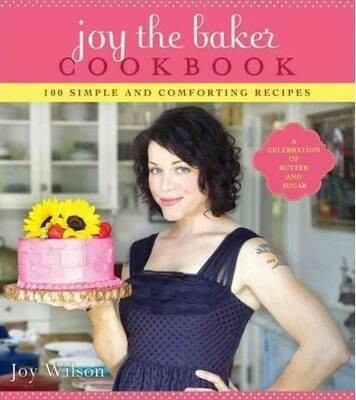 Joy the Baker Cookbook includes everything from “Man Bait” Apple Crisp to Single Lady Pancakes to Peanut Butter Birthday Cake. Joy's philosophy is that everyone loves dessert; most people are just looking for an excuse to eat cake for breakfast.